More zippers, my friends! Yesterday, we went over inserting an invisible zipper, which is the recommended zipper application for the Tania culottes. But it is just a recommendation – you do have options! So today I am going to go over two other zippers – centered and lapped. They are both pretty simple, I promise. 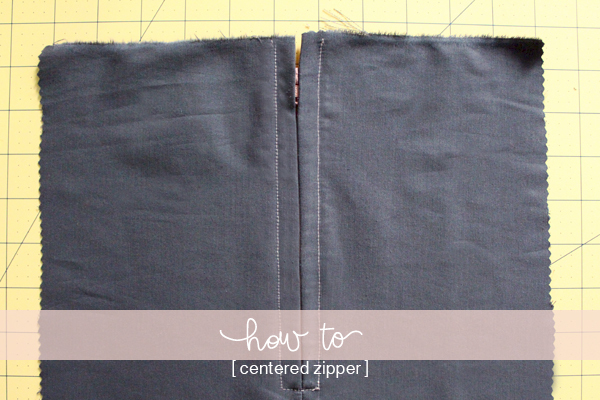 First up is the centered zipper, which is probably the easiest zipper ever. I’m going to show you a method using a glue stick and clear tape, in place of a bunch of basting stitches. Which makes it even quicker and more simple! 1. Start by placing your two pieces of fabric right side together, lining up the raw edges. Mark where the end of the zipper falls. 2. 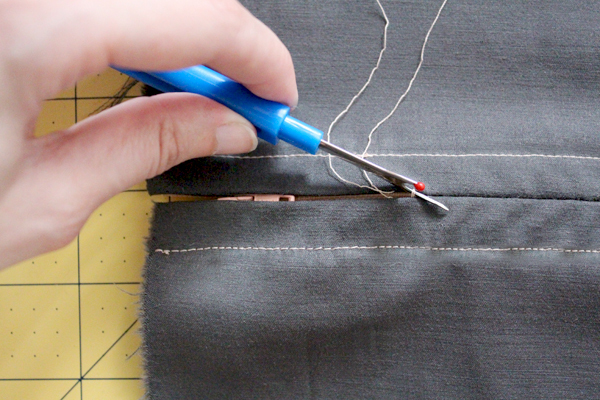 With 5/8” seam allowance, sew a row of basting stitches from the top down your mark. 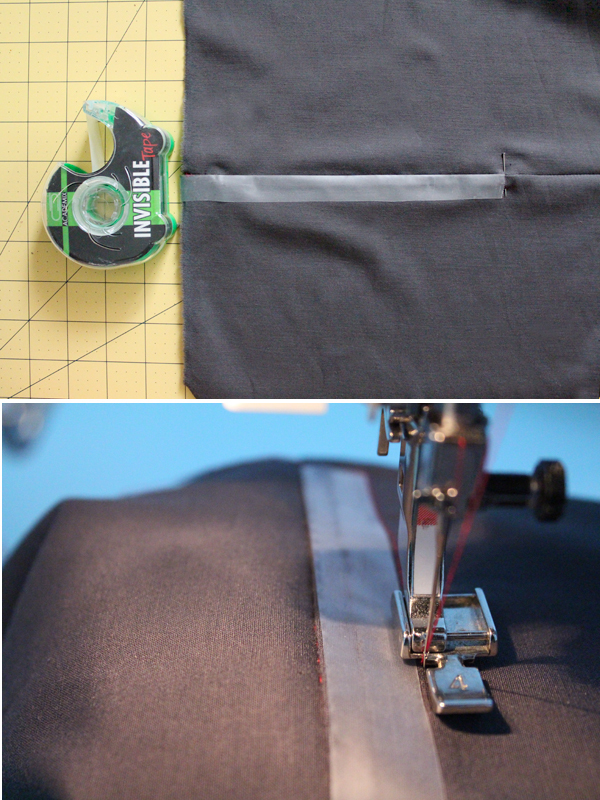 Without removing the needle from the fabric, set your machine to your regular stitch length, backstitch, and continue sewing the rest of your seam. 3. Press your seam open and flat. At this point, apply your desired seam finish. 4. 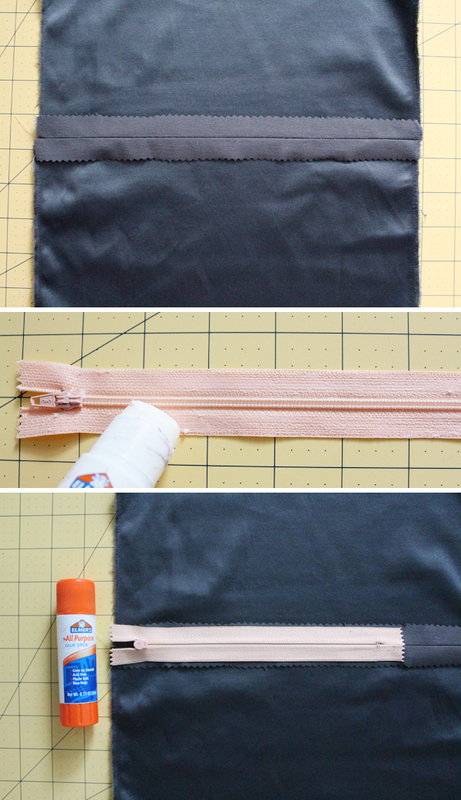 With your zipper facing right side up, coat each side of the zipper tape with a generous amount of glue stick. Carefully place, face down, on top of your seam. So that the zipper coil lines up perfectly down the center of the seam, and the top of the coil is about 5/8” down from the top raw edge. Press firmly, and let the glue set for a couple of minutes. 5. Flip over so that now the right side is facing you. Feel the end of the zipper coil from behind, and mark on the front. Place a piece of 1/2” clear tape directly over the center of the seam, and stopping right where your mark is. The tape will act as your straight guide for stitching. 6. Place your zipper foot on your machine. Starting at the bottom of your zipper, place your needle and zipper so that they are on the right side of the presser foot. Using the tape as your guideline, topstitch all the way up to the top. Backstich. Now move your presser for over to the other side, so that the zipper will be to the left of it. 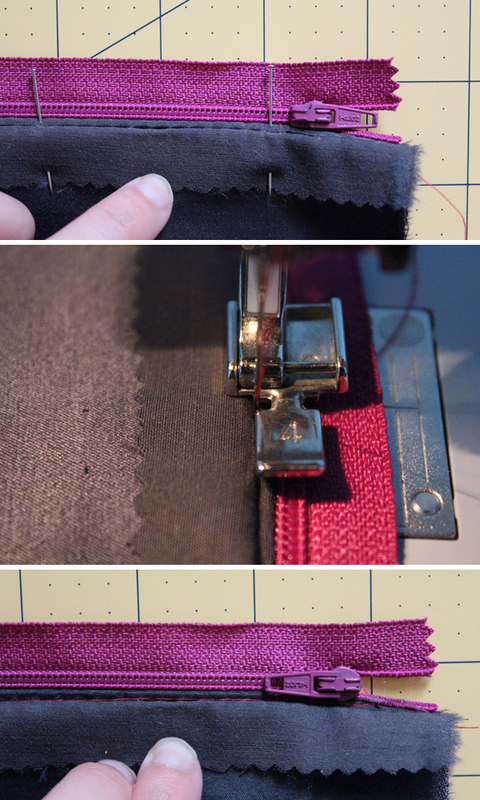 Start by topstitching across the bottom of the zipper. Again, using the tape as your guide. When you get to the corner, keep your needle down and pivot. 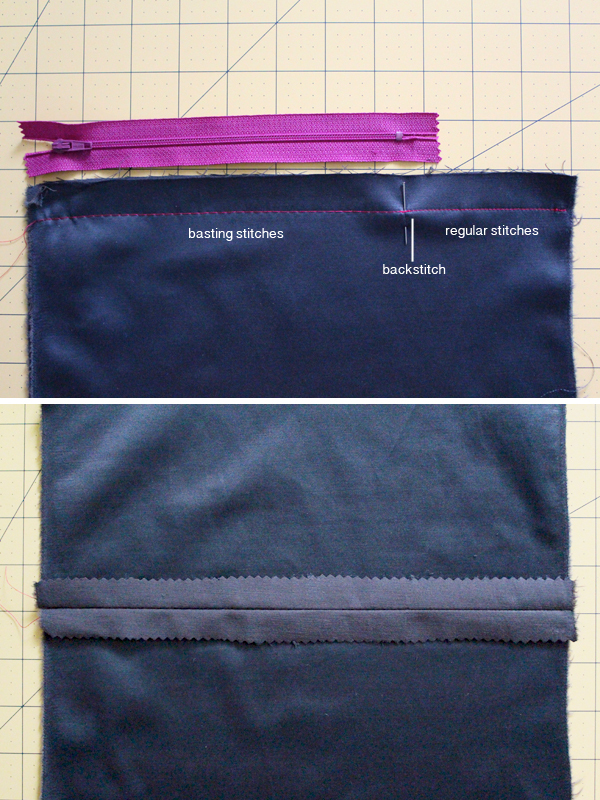 Continue topstitching up the other side of your zipper. Backstitch when complete. 7. 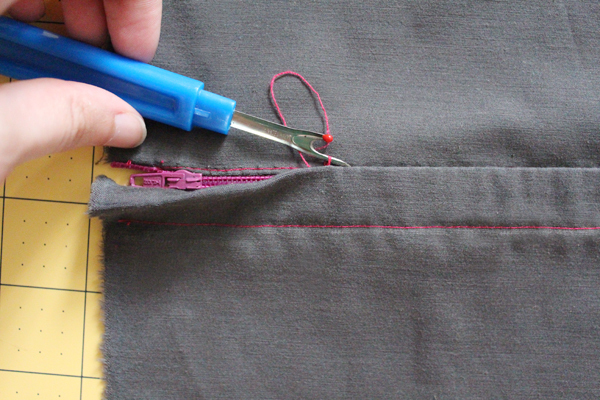 Remove the tape, and then remove your basting stitches with your seam ripper. Press if necessary. A lapped zipper has just a feeeew more steps than the centered option, but is still pretty simple. Just like the centered zipper, you will be left with some visible topstiching. 1. Just link with the centered zipper, place your two pieces of fabric right sides together, and mark the placement of the end of the zipper. 2. With your 5/8” seam allowance, start at the top and sew a basting stitch until you reach your marking. Without removing the needle from the fabric, set your machine to your regular stitch length, backstitch, and continue sewing the rest of your seam. 3. Press your seam open, and finish your seam edges with your desired finish. 4. 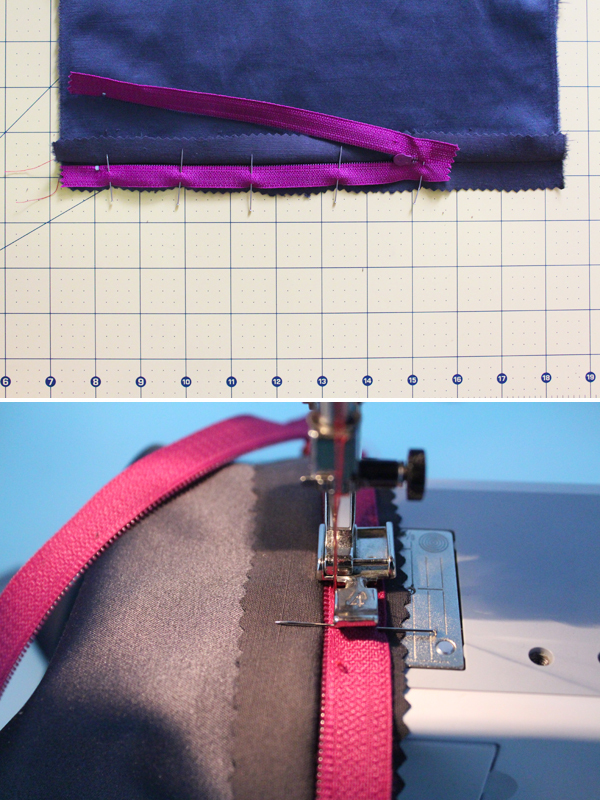 Place your seam so that the wrong side is facing you, and only the left side seam allowance is on that side. The fabric should be tucked under the right side. Open your zipper and place it upside down so the coil is directly on top of your seamline. The top of your zipper coil should be about 5/8” below the top raw edge. Pin in place. With the needle and zipper coil on the left side of your zipper foot, and starting from bottom of the zipper to the top, baste close to the coil. 5. Close the zipper and turn it so it is facing up. 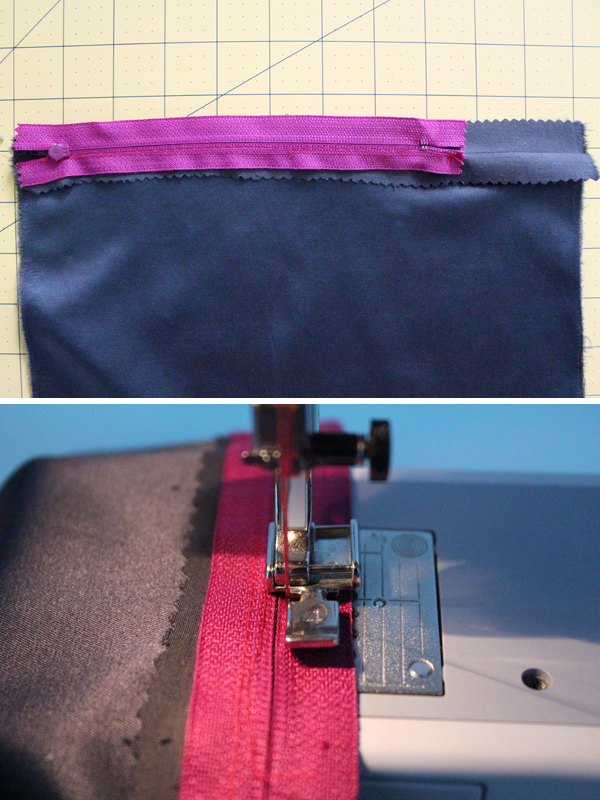 Pull back and smooth the fabric so that you can see a small fold between the zipper coil and basted seam. 6. Now turn your zipper back over so that the wrong side is facing you. With the needle and zipper to the left of the presser foot, machine baste the other side of the zipper tape to the seam allowance. 7. With the right side facing you again, mark where the bottom of the zipper ends. Place a piece of 1/2” clear tape so that the edge is right up against the seamline, and ends where your mark is. 8. 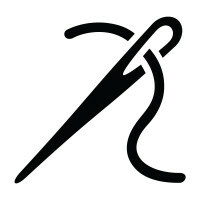 Starting at the bottom of the zipper, and with your needle and zipper to the left of the presser foot, start topstitching your zipper in place. You’ll be using the tape as your guideline, so keep your stitching right up against the edge of it. When you get to the corner, keep your needle in the fabric, and pivot. 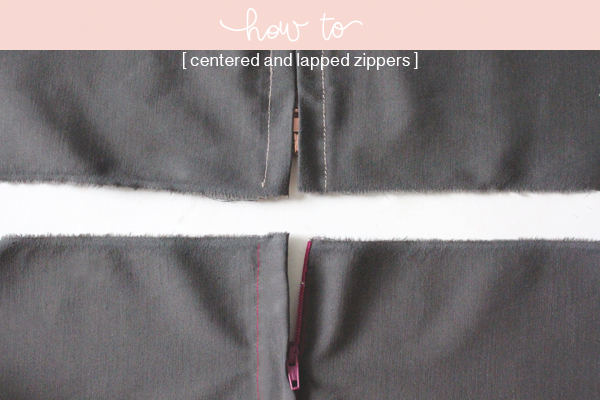 Continue sewing up to the top of your zipper. Backstitch when complete. 9. 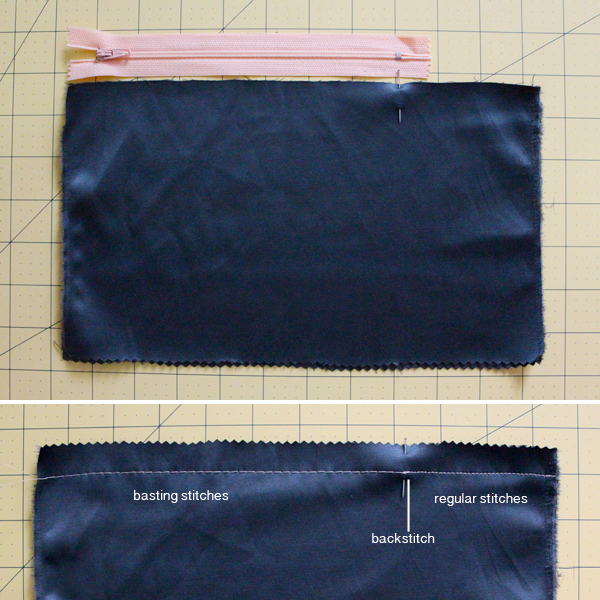 Remove the tape, and then remove the basting stiches with your seam ripper. Press if necessary. See, those weren’t too bad, right? Don’t forget, you can see how to insert an invisible zipper here. 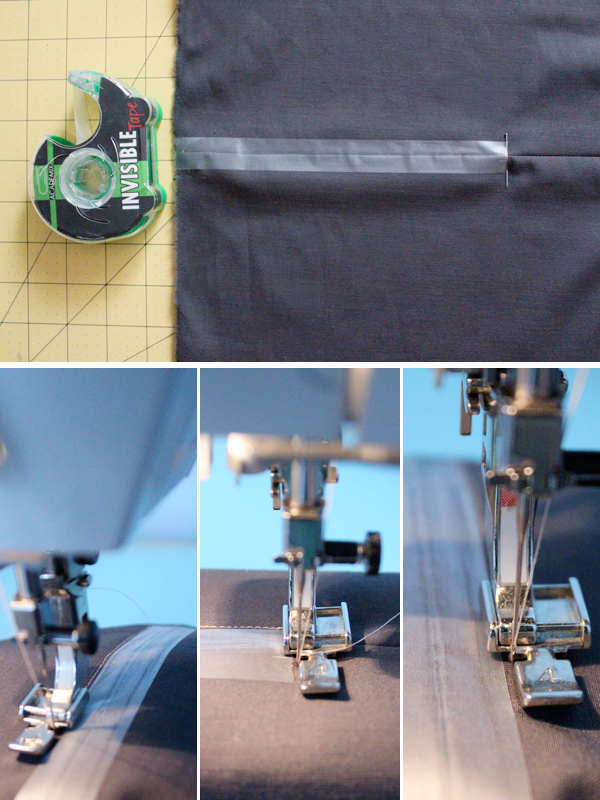 Tape as a sewing guide is a great idea! Centered zippers are simple, but I find that it is rather hard to get them looking perfect, especially since we’re so used to the look of invisible zippers in RTW. Thanks Kelly! I agree – centered zippers are not as clean and professional looking as invisible zippers, but are always a good option to have! Loved the article! thank you so much! i like this methods much better than my usual ones. On a slightly different note, i have a BIG problem when i attach a facing to the zipper (in a skirt for example).I like doing it all with the sewing machine and things are not always pretty :( the main problem is the top part where the skirt, the facing and the zipper meet. when i turn that corner inside out, the little fabric flaps that cover the centered zipper get squished down in an ugly way. Could you please show how to do it so we get those perfect corners? thank you! Thank you so much for this! 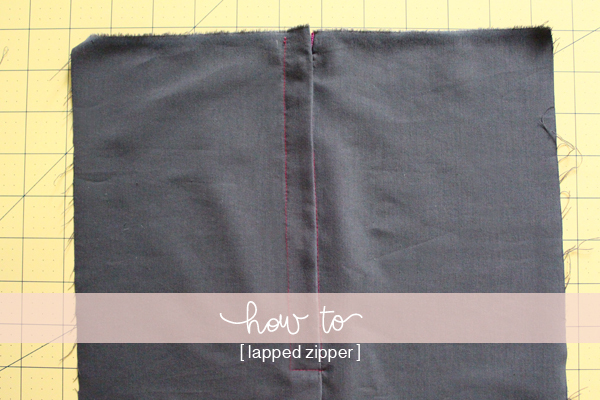 I was just looking for a good tutorial for lapped zippers last night and went to bed dissatisfied. And today I find this in my blog reader! Wonderful! Thanks for the tutorial, very good idea to use glue and tape, I’ll do that next time! What happens to the glue does it dissolve when washed?